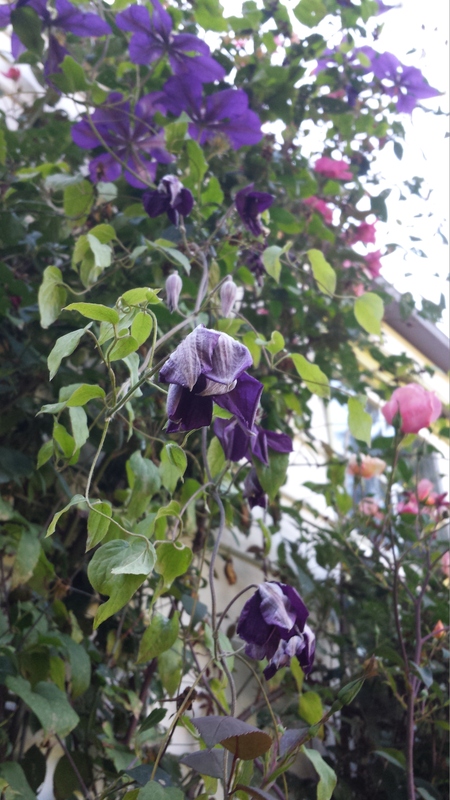 Clematis Gipsy Queen, which bears stunning deep-purple velvety flowers with reddish overtones on a substantial hearty plant (10-12′), is one clematis I personally can’t be without. 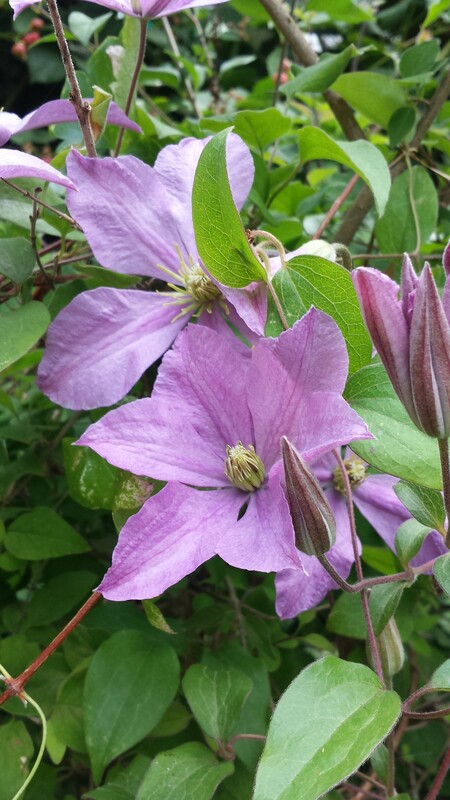 It has the additional bonus of beginning a six-week period of bloom in late July or early August when most other clematis have already dwindled. This plant resulted from a cross between Clematis Jackmanii and the large-flowered species Clematis patens in 1877 and has been gracing gardens for nearly 150 years. C. Gipsy Queen, one of the first clematis I planted after moving to Seattle in 2004, has bloomed its heart out year after year–until this year, that is. Imagine my dismay one recent morning when I discovered that more than half of the blossoms on my plant looked wilted! Heartache! 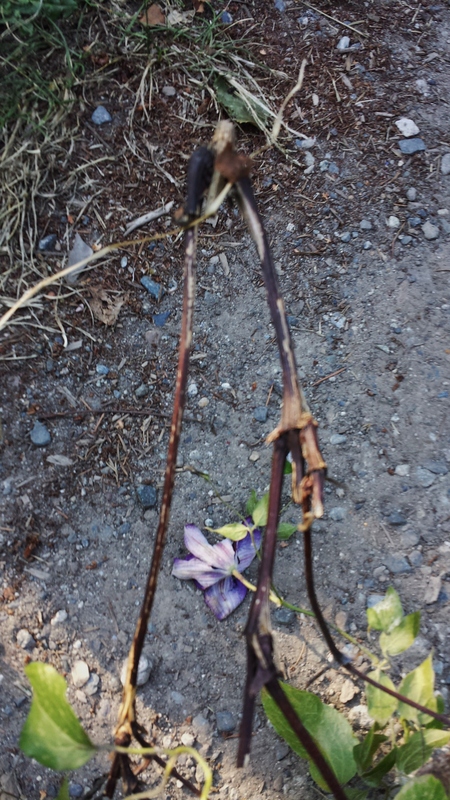 I knew that Gipsy Queen was not prone to the dreaded clematis wilt, so I followed one of the wilted branches back to the ground–and discovered a large old woody base that was the source of all the branches with wilted flowers. This junction seemed to be no longer able to support the branches that were depending on it. I pulled all those vines out and tossed them. What was left was a shadow of its former self. I can only hope that this plant will generate new vines next spring and come back as the large and gorgeous plant that I love. I guess the take-home lesson here is that we may occasionally need to rejuvenate older plants by cutting out large old woody canes to the base. I can think of a couple of venerable clematis in my garden on which I may have to perform surgery next spring. 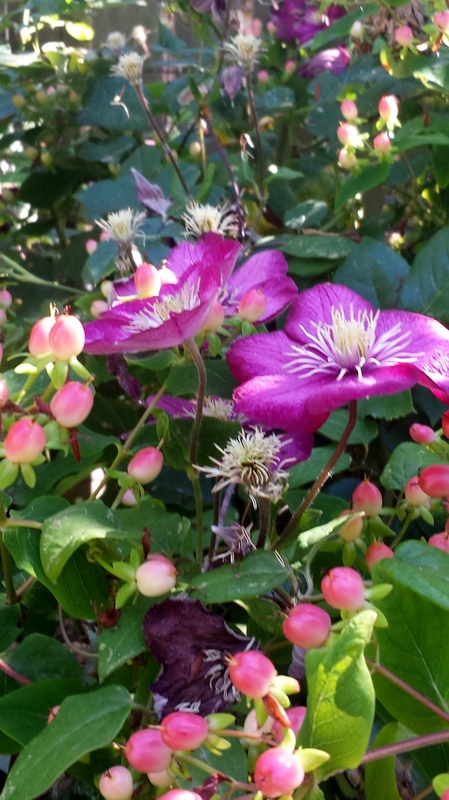 I love to grow clematis that just begin blooming in late summer, like C. Gipsy Queen. C. Ville de Lyon, for example, begins blooming for me about the same time, late July or early August. Bred in France in the late 1800s, this clematis has lovely two-tone pink flowers with a cream center. It looks as though it is a light pink flower whose petals are outlined in an intense dark pink. Once you see this one in person, you will always know it. It gets it’s coloring from its Texas parent, a red-blooming species clematis found on riverbanks in Texas, C. texensis, though it didn’t get the gene for the urn-shaped flowers of the Texas native. C. Madame Baron-Veillard begins blooming even later (second week in August or so) and blooms sometimes til hard frost. There is yet another late bloomer (that I don’t have yet — dang), C. Lady Betty Balfour. This clematis, progeny of C. Gipsy Queen, has stronger pink blossoms that C. Madame Baron-Veillard. 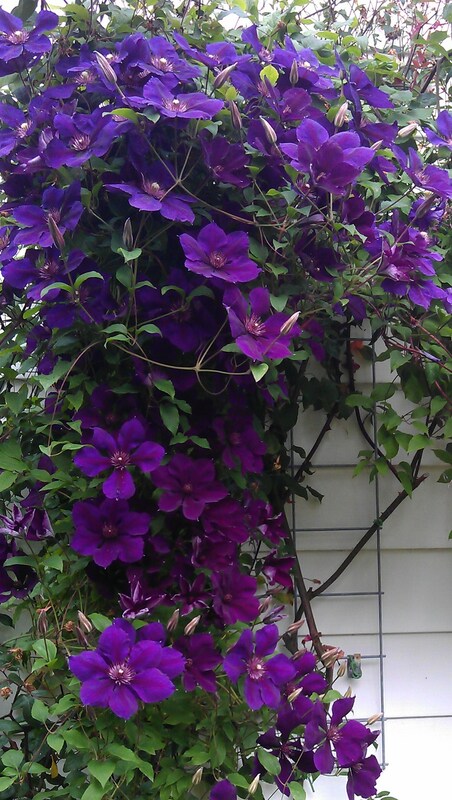 If you don’t already have one of these late-blooming clematis, extend your clematis blooming season by getting one!